Sundays — Sat evening: 5:30 p.m.; Sun: 9:30 a.m.
Second and Fourth Thursdays — 6:00 p.m.-8:00 p.m.
Second Thursdays — 8:30 a.m.-8:00 p.m.
As Catholics settled in the southeastern area of Meade County, Mass was offered in private homes. When the numbers grew larger, plans for a church building were made. 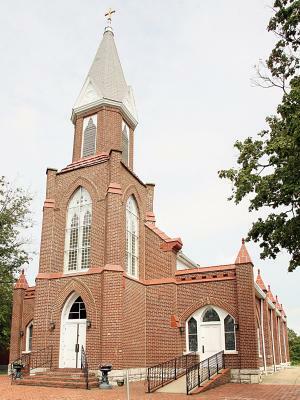 The church, named St. Martin of Tours, was dedicated in 1848. The first pastor was Father Charles Ignatius Coomes. Soon an addition was built, and, when the rectory burned, a new one replaced it in 1879. With stone quarried from across the church property and brick fired on the lot, a new church (the one standing today) was completed in 1894. In 1935 a house was built from the leftover stone, and a bell was installed in 1901. In the 1920s a white frame school was erected for grades one to eight, including living quarters for the Ursuline Sisters of Mount St. Joseph. In 1935, Flaherty High School was erected with volunteer help from parishioners. School buses were purchased and dormitories provided for high school girls from neighboring parishes. A new brick school was built in 1959. In 1961 St. Sebastian in Muldraugh, Kentucky became a mission of St. Martin, and more renovations took place, including adaptations to accord with Vatican II. In 1969 the high school was consolidated with Meade County, and the building was made into a parish hall. After 1983, the school closed, and the original white frame building was remodeled into St. Martin Center. With more than 150 years of history, St. Martin remains a community of about 1,150 parishioners of deep faith who are committed to bringing God’s kingdom on earth.